N.V. Consolidated Industries Corporation (CIC) is situated near the southern end of Paramaribo, the capital city of Suriname. We are a publicly traded company that was established in 1967 and are part of the VSH United group of companies. We commenced our commercial activities with the production and distribution of powder detergents for household and industrial use. The initial equipment included a spray tower, a steam boiler and a box-filling machine. The potential for success in different detergent types was quickly realized and we expanded to include a wide variety of liquid detergents, insect repellent and plastic packaging materials. In January 2010 replacement investments in the plastic- and liquid equipment had resulted in new production facilities, which further readied us for regional expansion. In 2012, emphasis was placed on our continued expansion in export markets and investing in research and development. Since then we have successfully re-launched and expanded many of our brand portfolios and have started exporting to 4 new destinations. 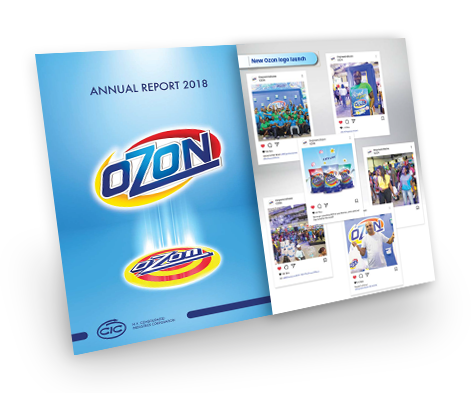 With just over 115 employees we proudly produce and market Ozon, Sun, Klinol, Witboi, Tropical Bush and Lysol products for our customer base in Suriname and most regional markets. We have committed ourselves to consolidation of our number 1 position in the Suriname market and to expand the market position of our products in the region for the benefit of our clients, employees, shareholders and society as a whole. Kathleen Healy’s commercial background and more then decade long experience in the fast moving consumer goods industry has readied her to take the Company to the next level. "The creative and strategic process towards our activities motivates me the most." "I’m proud to be part of a successful operations team at CIC, as operations is essential to the company, in consequently delivering as promised." "The culture at CIC is exceptional . We hold fast to our values - there is equality; honesty and hard work at every level in the company." "My job gives me the opportunity to do something I love and enjoy the most." "I'm proud to be a partner of a successful business. Only honesty and sincerity make you successful." "Attention to Health, Safety, Environment and Quality (HSEQ) is an important part of everything we do, every day and everywhere. I like to support employees from different departments to bring HSEQ at a higher level." "I like my dynamic job. The tasks and the diversity of people allows me to enjoy my work every day. I love to deal with everyone, at all levels and both internal and external." Our sense of responsibility towards the community and the environment, in which we operate, both ecological and social, focuses on many different areas. Decreasing our consumption of electricity and water by investing in renewable energy projects has resulted in energy reduction annually of 5%, while saving approximately 900M3 potable TAB water and the use of 14% less fossil fuel. Since our inception in the VSH Community Fund in 2013, we have donated more than SRD 200,000 to support social projects within our local communities. To further cement our corporate responsibility, our way of doing business is guided by our Code of Conduct which applies to the members of the Supervisory Board, management, employees of CIC and all customers, suppliers, service providers, contractors and other relations of CIC who perform activities for or on behalf of CIC. We are deemed to always be aware of these provisions and to apply them in all of our activities on behalf of CIC. In October 2006, CIC became ISO9001 certified. The ISO9000 family of standards addresses various aspects of quality management and contains some of ISO’s best-known standards. It is our policy to satisfy our customers by providing them on time products and services that meet their requirements and enable them to achieve their goals. This is achieved with a continuous improvement mindset and critical eye on quality in all aspects, were consumer and market demands are central and every employee in involved. In October 2013, CIC became ISO14001 certified. The ISO14000 family of standards provides practical tools for the Company to manage our environmental responsibilities. ISO14001 focuses on environmental systems to aid us in achieving this. Our Environmental policy guides us to be aware that the operations of CIC have an effect on our surroundings and we commit ourselves to ensure that all of these activities have minimal impact on the environment.